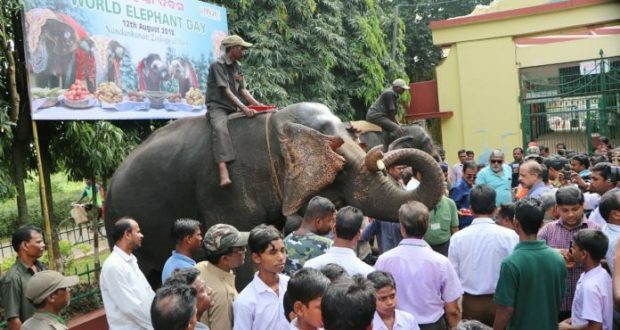 Bhubaneswar:12/8/18; Nandankanan Zoological Park today observed World Elephant Day amid the presence of people from various walks of life. World Elephant Day is celebrated to conserve and protects elephants from numerous threats they face now a days. On August 12 2012, the inaugural world elephant day was launched to bring attention to the urgent plight of Asian and African elephant, to share knowledge and positive solutions for the better care and management of captive and wild elephants. African elephants are listed as “Vulnerable” where as Asian elephants are listed as “Endangered” on the IUCN Red List of threatened species. H.S.Upadhaya, Director Nandankanan Biological Park, Jayant Kumar Das, Deputy Director, Nandankanan Zoological Park, K.L. Purohit, Deputy Conservator of Forest, Nandankanan Biological Park besides local PRI members, journalists, school children and visitors from all walks of life took part of the function held for the occasion. The celebration was observed with a mass awareness programme amongst the visitors with a message for elephant conservation. The elephants were received a special treat of coconut, banana, sugarcane, maize, grapes and apple. The mahouts were also felicitated in the auspicious occasion for their hard work. A meeting convened to distribute prizes to the winners of Sit & Draw competition which was organized previously.